As the official site of the New Orleans Jazz and Heritage Festival (http://www.nojazzfest.com/), as well as the legendary birthplace of jazz, the Big Easy beckons music-lovers from around the world every spring. Now in its 48th year, the 2017 jazz blowout – known locally as the Jazz Fest — is slated to run from April 28-30 and May 4-7. This festive event celebrates the music and culture of Louisiana as more than 460,000 visitors converge on New Orleans for a huge jazz party, complete with second line parades, food and lots of live entertainment. The Jazz Fest takes place at the Fair Grounds Race Course, which is located 10 minutes from the French Quarter. This massive venue features 12 stages that offer continuous music from 11 a.m. to 7 p.m..
Music ranges from jazz, blues and zydeco to folk, rock and rap. There’s even a kid’s tent for the little ones. 2017 headliners include Stevie Wonder, Tom Petty and the Heartbreakers, Dave Matthews, Earth Wind and Fire and Tower of Power. And as more musicians stream into New Orleans, you’ll find more street performers in the French Quarter. In short, everywhere you look there’s music. When you get hungry, you can whet your appetite at one of the two large food areas, where you’ll have your choice of everything from crawfish and alligator to vegetarian plates and even the standard burgers and brews. Save some time to browse the crafts area, where artisans from around the world demonstrate and sell their wares. All in all, it’s a very full day. 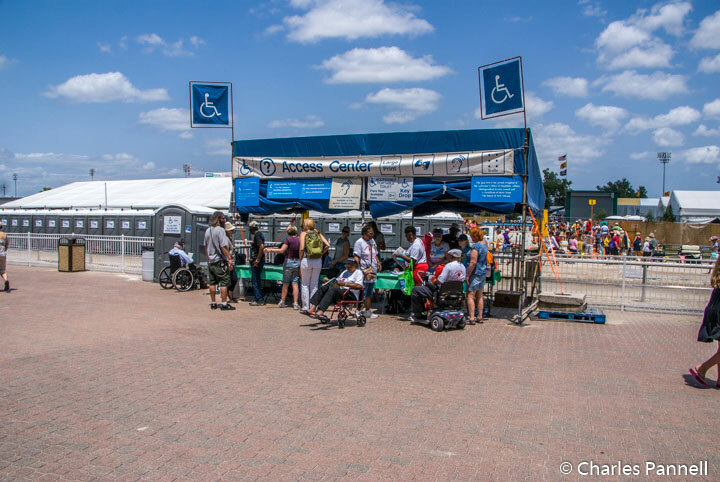 Even though it’s a huge event, access hasn’t been overlooked at the Jazz Fest. Accessible parking is available near the front gate on Gentilly Boulevard. There is a $50 per day fee for these limited parking spaces, which are only available to folks with an accessible placard or plates. If you’d prefer to let someone else do the driving, then buy a ticket on the Jazz Fest Express bus. Operated by Gray Line Tours, these buses will run continuously from the Sheraton Hotel, the Wisner Boulevard parking lot and the Steamboat Natchez Wharf in the French Quarter to the Fair Grounds Race Course. The roundtrip fate to downtown is $19, and to the Wisner lot is $15. Accessible (lift-equipped) transportation is available upon request. Call (504) 569-1401 or (800) 233-2628 to make advance arrangements. 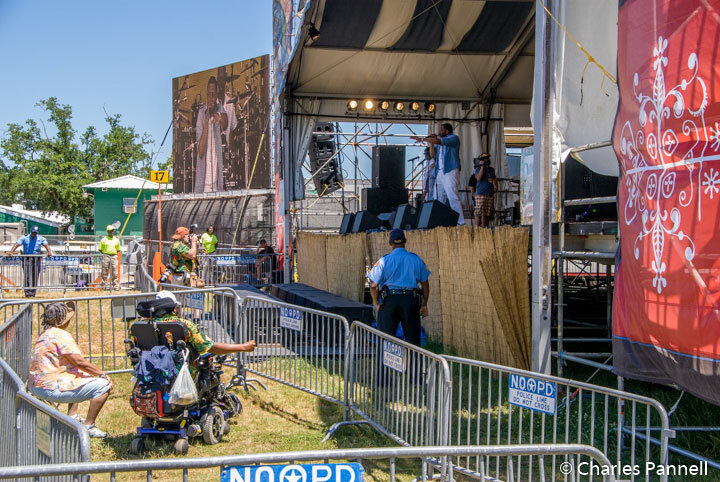 Alternatively, you may be able to arrange for accessible transportation through RTA Paratransit Service (504-827-7433); however advance reservations are a must and the demand is usually quite high during the Jazz Fest. Reserved accessible seating is available in all tents and stages, and Access Program ushers will be on hand to help folks find those seats. Additionally, an Access Center will be located in front of the grandstand. The combination to the accessible restrooms (porta potties) will be available there, along with a map indicating their locations. The Paralyzed Veterans of America will man the booth next door, which will offer free loaner wheelchairs to folks who can’t manage distances. The festival grounds have a variety of surfaces, including grass fields, a dirt track and paved pathways in the infield. Reinforced surfaces are also installed across the dirt track to increase accessibility. The accessible routes are clearly marked, so be on the lookout for these signs. And don’t hesitate to ask the folks in the Access Center if you need any assistance. And if you have any access related questions, feel free to e-mail access@nojazzfest.com or call (504) 410-6104 in advance, or (504) 942-7717 during the event. All in all it’s going to be a fun and accessible event, so come on down and enjoy yourself in the Big Easy.